Zoomhash, a USA-based company selling Gridseed ASIC miners has started selling voltage modified Gridseed G-Blade miners though they call them Zoom-Blade. The Blade Miners are available in two versions, a 6.2 MHS (VMOD1) that apparently can run at up to 925 MHz and 170W power usage and a 7.5 MHs (VMOD2) model that can work up to 1050 MHz with 300W power usage. 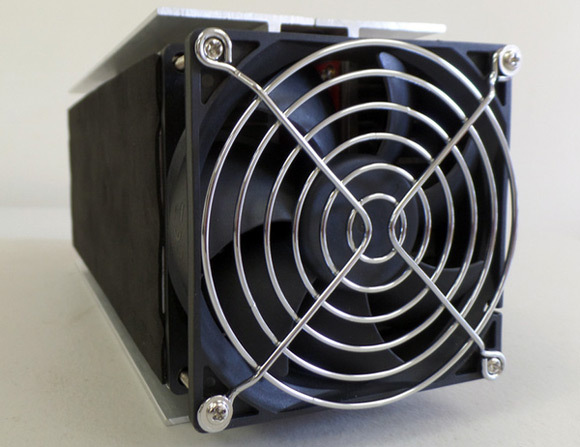 There is no information about actual improvement in the power scheme of the voltmodded devices, only about improved cooling, so in our opinion if you are not very careful in what environment they are going to be placed you might have some trouble with these miners. Overheating and burning up voltage modified G-Blade miners is not that hard to get if you place them in a hotter environment and the cooling is not sufficient enough to handle the extra load. Out experience doing a voltage mod of the G-Blade has shown that the miners are able to handle some extra voltage and be overclocked a bit with good extra cooling. Pushing them to 1050 MHz however could be more of a problem as the power block of these devices is definitely not designed to handle 150W per PCB, and even with some extra cooling you could still have problems with high temperature and that could easily lead to problems with the hardware. So we advice extra caution should you decide to go for a voltage modified G-Blade miner, or to modify your own miner. Zoomhash has apparently done tests, but if you place the miner at a place with higher ambient temperature you could still have issues with the proper cooling of the device. So be extra careful and monitor the voltage modified miners very closely at least the first 24 hours in order to be sure that they are staying cool and will be able to operate problem free for long time. 1125Mhz gave me 7.5MH/s, but not stable on my proto. I know this is a teal shot in the dark but …… if there is even the smallest possibility of replacing the stock power supply “onboard” with severely over sized once that it would be able to run sha256 ? extream measures? Lets say you manage to do that, it will mean that you will be getting about 100-120 GHS for SHA-256 mining with almost 1 KW of power usage. You will need to think of a serious improvement of the chips cooling in order for them to be able to handle that as well and in the end it is not worth it at all. They won’t do after-market mods for anybody, even the ones that just bought blades from them.